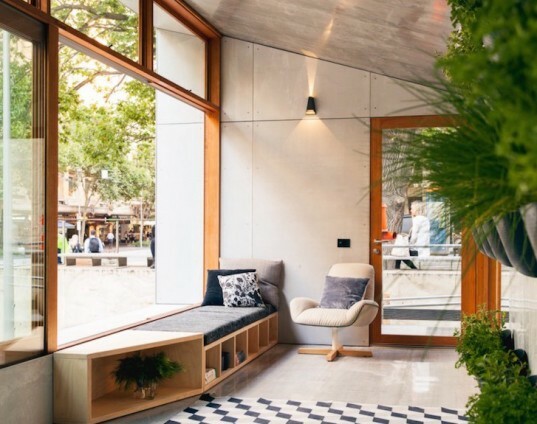 Australian architecture firm ArchiBlox recently unveiled Australia’s first carbon-positive prefab home that’s packed with eco-friendly features and gorgeous to boot. Contemporary and cozy, this light-filled mobile home is sealed within an airtight 800-square-foot structure that locks in cool air and keeps Australia’s intense heat out. 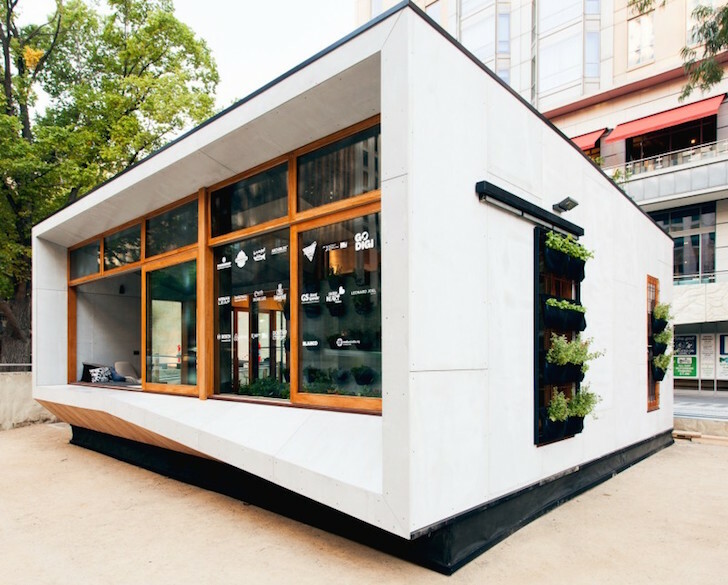 The solar panel-topped Carbon Positive House prototype can produce more energy than it consumes and is currently on display in Melbourne’s City Square. Fronted by a floor-to-ceiling double-glazed facade, the self-sufficient Carbon Positive House was designed to maximize solar gain and passive design strategies. Instead of relying on mechanical heating and cooling, the naturally ventilated home uses in-ground tubes to pull in cool air from the south side. The building is topped by a green roof for added insulation as well as a set of sliding vertical garden walls that shade and cool the building in the summer. The north-facing home is divided into two main areas: the double-glazed sunroom that serves as a buffer zone and spans the width of the structure; and the living quarters tucked behind the sunroom on the southern side. The compact living space comprises an open-plan dining area and kitchen on one end, and a bathroom and bedroom on the other; the private area is separated from the common space by a modular cabinetry wall. The bright and airy wood-paneled interior is made up of sustainably sourced and non-toxic materials, and the home’s energy-efficient appliances make use of rainwater recycling. Also... Now all we need is to get a company that has the price point vision to sell these units at a realistic amount (vision to generate profits by placing affordability ahead of exclusion pricing to elevate their companies status and their profit margin by way of financial graft) and the financial capacity that can deliver a truly modular form of these using automotive manufacturing processes instead on wasteful insitu housing construction still used today. Finally a marketing programme that actually supports and simplifies the benefits of Eco architecture instead of creating more confusion over carbon/energy efficiency. Energy efficient housing can be marketed more successfully without the contradictions and confusion getting in the way. Why is the design shown FACING SOUTH? As was the display home that was in the shadow of City Square in Melbourne. Other immediate details that stand out are the poor contact with the ground and virtually no summer sun protection. This needs two large deciduous trees strategically planted in front of it. How can you SHOW an effect when you are in fact showing exactly the opposite. No wonder the average punter gets confused and doesn't get the message. This is the problem with the muddled presentation that seems to afflict the whole eco/architecture space. Taking basically simple principles, which do still need to have detailed resolution, then showing them off in grandly confusing and contradictory fashion, with a lot of gumpf attached. how is it carbon positive? I think thats a bit of an overstatement. The outrageous price is not offset by enough energy savings. We need a commitment to affordable housing that is completely self sustaining. It is possible. Just do not allow greed to take it off the table. Well the 260k price tag kind of defeats the purpose. If a lot of people can't afford it than it's not going to do any good. I am a builder. I can definitely build this house for 100-110 dollars sq ft. The cost quoted is exorbitant. I love this, but i don't see $260K in this design. One thing that seems to happen when it comes to sustainability is that the prices are always exorbitant. Yeah, looks nice, but we already know how to make nice-looking houses. I sure wish we were given more information on how it is "carbon-positive." Do they really mean "carbon-positive" (meaning it actually subtracts carbon from the air) or do they mean "energy-positive" (meaning it produces more energy than it consumes.) It is called Carbon-positive but the article only mentions energy. And does that include the carbon load in the materials, and transporting the materials? And how exactly does it make energy? The photos show what looks like solar cells on the roof, but the story doesn't mention it. In fact it says the house has a green roof, which doesn't seem possible if it also has solar panels. Or is this just a rewording of their press release? Perfect for Retired Me, Grands Visit, and my love of Plants....My Bentley (Dog) happy anywhere. Wonderful idea. According to the Archiblox www in Aust this model sells for $260K GST (10%). Let see How we make Eco house , Please check out more detail at http://lukastrade.com/Eco%20house%20project.html Some process of Eco house construction Ecohouse and protection from the summer heat If it is true that every insulation protects us from the cold winter is not the case for the summer heat. Heat protection is achieved only with materials that offer high values of phase shift and amplitude attenuation of the thermal wave. When can we buy one and how much? A great concept but would it work for any size of a house? It seems quite small for a family home. And what if you live in colder climes or places that don't get and an awful lot of sun? Can you store the energy you don't use? http://www.archiblox.com.au/designs/ the website of the company for those asking. Hi There, Could you let me know the purchase price please? AUD and where they are located at. I like it ,I want one.Any costings available ? Is there a UK version? That is, one which copes with dank chilly grey weather! And how much do these houses cost? Please send more detail. Thanks and congratulations on a lovely and sensible design. Hello Staff, For a one bedroom unit what is the price to have it supplied. Is your company located in Perth WA. What is the transport costs. Do you have a design for a two bedroom unit? Many thanks for your help. For heavens sake!What's "800-square-foot structure"? You dingbats we haven't had "foots" for 50 years since LAST CENTURY!! If you are so "Contemporary" why not drag yourself kicking & screaming into the 21st century and show respect for our kids & migrants. Here are some words you should be using if you want prospects to believe you are modern. Hectarage (not acreage)litreage (not gallonage) kilometrage (not mileage or cranktanker milage). There are many others you are obviously uneducated about!!! Just be careful to avoid the Macquarie & it's relation Webster's, dictionaries. Use The Australian Oxford English Dictionary compiled by the Australian National University. Is this available in USA? What would be the approximate cost of the house in USA? Perfect house. When can we get one in the US and how much? This whole article is just wrong. Unless Australian scientists have discovered a way to violate the 2nd law of thermodynamics (spoiler alert: they haven't) then there's no possible way that this house creates more energy than it consumes. That goes against the laws of nature. will this ever be available for canadian climate? if so what cost? Awesome concept and cool article! Careful on terminology though. "Creating energy" is a violation of the conservation of mass and energy. The ArchiBlox uses solar panels to convert the sun's energy into heat and power (thus not 'creating energy' but rather converting it). It uses solar power instead of burning coal, avoiding the carbon dioxide byproduct of burning coal. And as others have said, it's carbon-negative in that it removes more carbon dioxide than it produces. As pointed out by thegrem, the title of this article is very misleading and frankly incorrect. From what I can find from other sources, it appears that this confusion is present at the level of the designer. To clarify, in ecology, we refer to things that permanently remove more of the greenhouse gas carbon dioxide (CO2) from the environment (i.e. by converting it into biomass) than they create as being a carbon sink or carbon-negative. However, I think the confusion over this term may have arisen due to the fact that this model is energy-positive, meaning that it creates more energy than it consumes. I think the big question is, how much is this and when, if ever, will this come to America? Carbon positive housing? I would be much more impressed of it removed carbon instead of generating it. Surely that would be carbon-negative?? If it produces more energy than it consumes? Fronted by a floor-to-ceiling double-glazed facade, the self-sufficient Carbon Positive House was designed to maximize solar gain and passive design strategies. Instead of relying on mechanical heating and cooling, the naturally ventilated home uses in-ground tubes to pull in cool air from the south side. The building is topped by a green roof for added insulation. A set of sliding vertical garden walls shade and cool the building in the summer. The north-facing home is divided into two main areas: the glazed sunroom in front and the main living spaces in back. The sunroom serves as a buffer zone and spans the width of the structure. The compact living space comprises an open-plan dining area and kitchen on one end, and a bathroom and bedroom on the other. The private area is separated from the common space by a modular cabinetry wall. The bright and airy wood-paneled interior is made up of sustainably sourced and non-toxic materials. The solar panel-topped Carbon Positive House prototype can produce more energy than it consumes and is currently on display in Melbourne’s City Square.